By now, you’ve probably gathered that I’ve been doing a lot of thinking in terms of rearranging my life in order to make things simpler, right? I’ve been doing a lot of decluttering, and trying to be more intentional about what I’m bringing in. Maybe it’s just nesting, maybe it’s a full lifestyle change, who knows? But, even before I was pregnant, I thought I had a pretty good hold on my makeup bag. I love my makeup, but I’ve been pretty good at sticking to one makeup item from each category. However, while I think I’ve done a good job at keeping my makeup collection to a minimum, I’ve also recently been introduced to the concept of clean beauty, and now I’m thinking that the whole thing may need an overhaul. Thankfully, because I’ve been pretty good at keeping everything to a minimum, my makeup bag does have quite a bit of turnover. So, it shouldn’t take too long to get it in better shape. I did still want to share what my bag looks like now, though, so that maybe we can see some progress in a few months, and I can give you an idea of what I think about the makeup that I am currently using. Chanel Vitalumiere Aqua Foundation in No. 10 Beige. I really love the finish of this foundation! It has such a nice, smooth feel without being too heavy. I’d say it’s a medium coverage, so it’s not going to cover up everything, but it does give you a nice, natural look. Unfortunately, as much as I love this foundation, this is going to be replaced when I run out, since the only information I could find on the cleanliness of it wasn’t particularly good. Too Faced Born This Way Concealer. There’s not a lot to say about this concealer. It does what it’s supposed to, but still finds its way into my fine lines, even when I’ve used it with a Beauty Blender. Maybe I’m doing something wrong, maybe it’s the concealer, who knows? Either way, I’m ready to try something different! Having said that, this one was only “mildly hazardous” according to ewg.org. Charlotte Tilbury Cheek to Chic Blush in Ecstasy. I was kind of on the fence with this blush for a while until I realized that I was using it incorrectly. There are two different colors in each of the Cheek to Chic blushes, and you are meant to use the outer ring as an everyday color, and the inner circle as an extra pop on the apples of your cheeks. Total game changer – I love this blush, now! I couldn’t really find any information on the safety of any of my Charlotte Tilbury products, though it is listed as free of the top allergens according to skinsafeproducts.com. Too Faced Shadow Insurance. This has been a staple forever, right? It works, it’s good, but I’ve had so many tubes of it that quite honestly, I’m bored. I’ve used the Urban Decay Primer Potion multiple times; I’ve tried the Nars eye primer – nothing excites me. Maybe eye primer just isn’t exciting? I don’t know, but this was another “moderately hazardous” product according to ewg.com. Charlotte Tilbury Lip Cheat Lip Liner in Pillow Talk. The Pillow Talk Blush and Eyeshadow have been everywhere online lately, haven’t they? I’m not sure why the lip liner hasn’t been getting more press, because I actually really love it, and it’s perfect to pair with so many different lip colors! Charlotte Tilbury K.I.S.S.I.N.G. Lipstick in Stoned Rose. I love a good rose toned lipstick! Every time I go to find a new lipstick, I think that I’m going to branch out and try something new, but then I find the prettiest new rosy color, and that’s what ends up coming home with me! 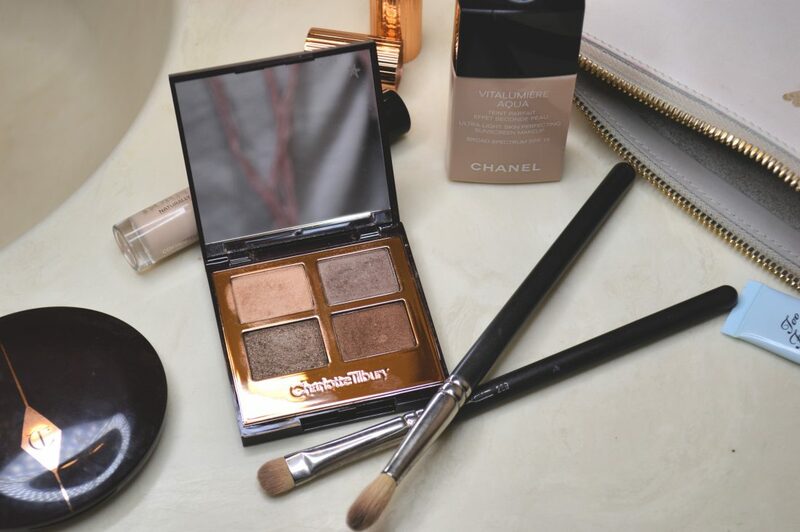 Charlotte Tilbury Luxury Eyeshadow Palette in the Golden Goddess. As an incredibly fair skinned person with olive undertones, I’m not sure why I would go for anything called “Golden Goddess”. I love the way this palette is set up and the quality is amazing, but I’m not convinced these are the colors for me. Chanel Signature de Chanel Intense Longwear Eyeliner Pen. Eyeliner is my very best friend. I love doing a tiny little cat eye every time I do my makeup. In fact, my most minimal makeup look is typically a little wing with some mascara. I’ve found that eyeliner pens are the best at getting that perfect wing, and I like how this one is structured so that I can get a nice, super thin line, or give it a quarter turn to have a wider line. 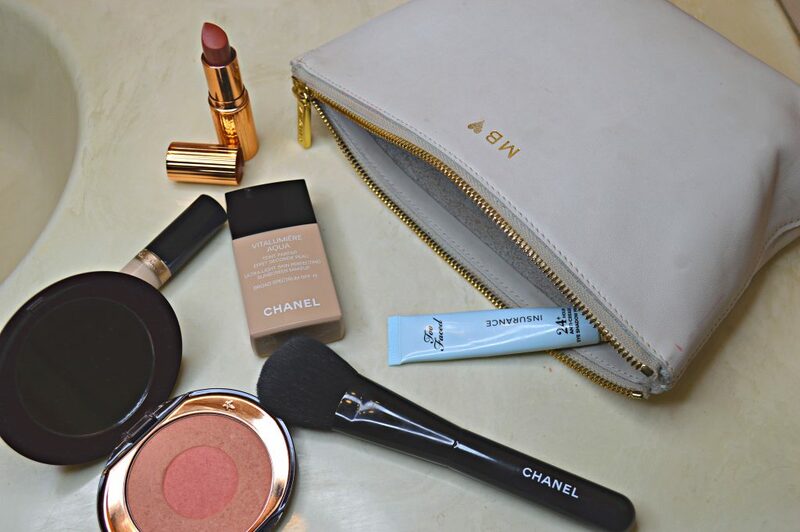 Sadly, as much as I love my Chanel makeup, it’s probably going to have to be the first to go in my makeup bag overhaul. Chanel Inimitable Intense Mascara. Okay, to me, mascara is mascara. About all I’ve really noticed is that some formulas are drier, which I like, and some are wetter. The wetter ones will end up all over my face because I’m not patient enough to let them dry. Because this one is drier, I like it, it does its job, but it’s not the end all, be all. 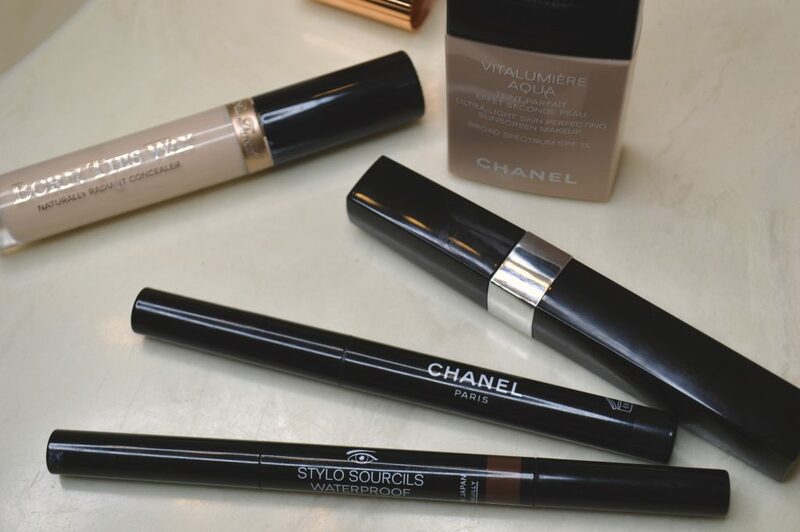 Chanel Stylo Sourcils Waterproof Eyebrown Pencil in Auburn. I’ve noticed that sometimes it doesn’t show up on camera, but my hair is a deep auburn, bordering on brunette. Because of this, I really do need an auburn eyebrow pencil, but there really aren’t many on the market to choose from. I was talking to a friend of mine recently about some clean beauty options for an auburn brow pencil, though, so I think I can find something a little better to replace this with! So, that’s currently what my makeup bag looks like. In a few months, it will hopefully look much cleaner than it does, now, and I’ll certainly update you on what I’ve chosen for replacements! I’m so excited about this new chapter in our lives, and I hope you’ll be along for the ride!